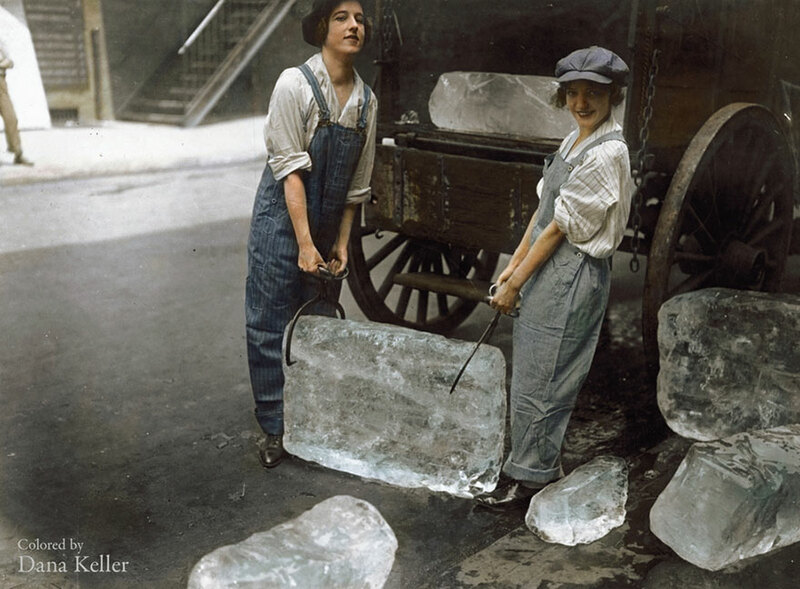 I’ve had this picture of two women delivering ice in 1918 for months on my computer and I recall seeing it for the first time on Tumblr. I eventually found it in clearer condition on http://imgur.com/gallery/2IHWs, which showcases a lot of stunning historical pictures that have all been transferred from their original black-and-white format to color. The size is 115 KB. I acquired it in jpg. format, however the original black-and-white photograph was taken by an anonymous photographer and was later colorized by Dana Keller in either 2014 or 2013. It was then published in “American Unofficial Collection of World War I Photographs, 1917-1918.” The caption that accompanies the picture when it was taken in 1918 reads, “Girls deliver ice. Heavy work that formerly belonged to men only is being done by girls. The girls are delivering ice on a route and their work requires brawn as well as the patriotic ambition to help.” In this context, the picture was most likely taken to boost the morale of World War I propaganda throughout the United States, considering that it was at this point in the war that many American men had been enlisted and shipped overseas to fight. Not only does this image reflect the intentions of early American war propaganda, but it also presented feminist ideals that were very similar to the ones being evoked during World War II. Since men weren’t around to do any so-called “heavy-lifting” the only other source of employment that industries could turn to was women. These women are presenting a type of feminine strength very similar to the strength Rosie the Riveter proudly displayed during World War II when women were left to care for the home-front while men were overseas. However, along with taking care of industries back home, women were also allowed to enlist in the United States Navy or Marine Corps as either nurses or actual combatants. 400 women died while serving. While their shifting strengths on the battlefield and at home did catch many people’s attention, it didn’t do much to change the outlook on women’s roles in the United States, however, since some women took an active part in the war, the United States, Canada, and some European countries expanded women’s suffrage in the years after the First World War. I wanted to post this picture not only because of its portrayal of sheer feminine strength and determination, but also because its very rare that we get to see these types of images during these times of great trouble. It isn’t everyday that you see a picture from almost 100 years ago of women delivering ice, and it’s even rarer if they’re smiling at you while they were doing it. 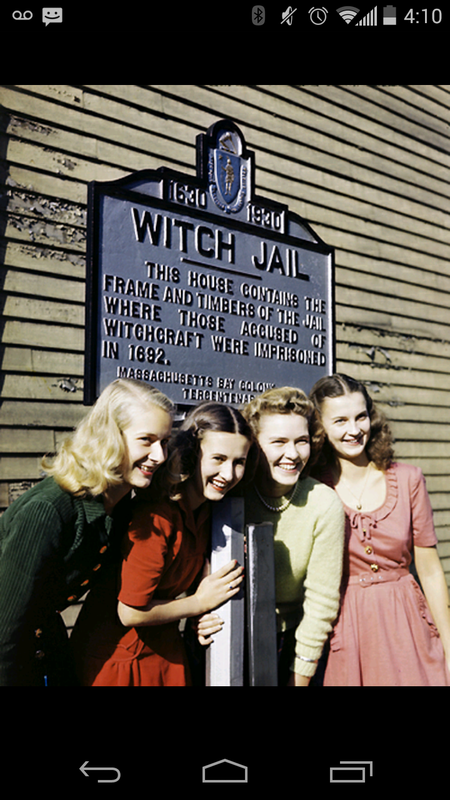 The picture above shows meta history– high school aged girls from the ’40s on a school trip in Salem, Massachusetts where countless innocent people were accused of witchcraft in the 1690s and executed. It’s funny how present everything seems to us, but in reality, history passes by us everyday. It was highly unlikely back then that any of these young women could have predicted how awestruck we would be looking at this picture today, how full of history it truly is and how much substance it holds. These girls were living in a time of great apprehension with World War II lurking just beyond them; the Salem Witch Trials were a period of fear and suppression. These time periods were three hundred years apart, yet the similarities are astounding. Their impact on American society has shaped the way we are today, not only as a country, but also as a people. 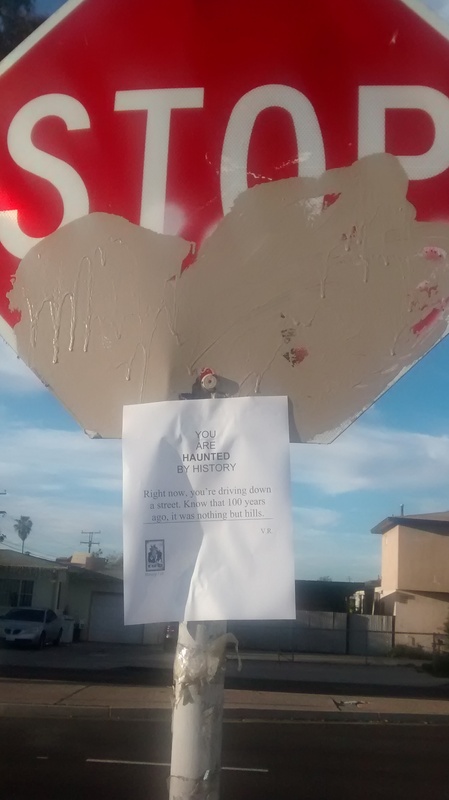 I have a very active tumblr blog, and while I was scrolling, I came across this. 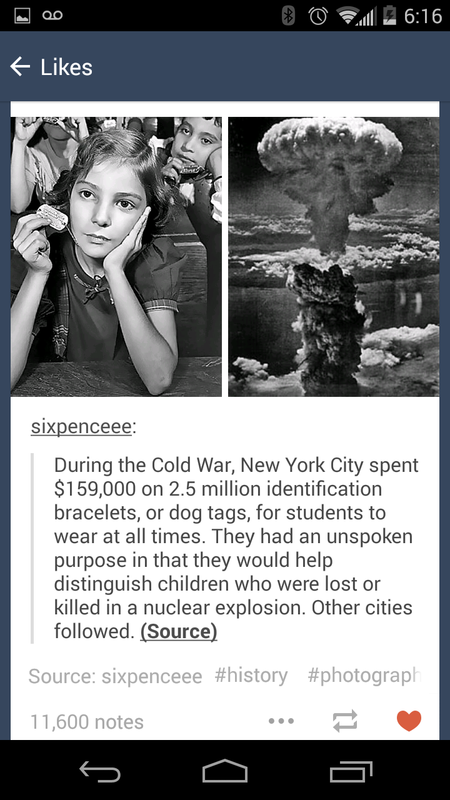 Apparently, children had dog tags during this time period so that if a nuclear attack came around, then they would know who’s child lived and died. The culture of fear directly affected children, even though these children had no way of knowing that they were being labeled in case they all perished. It really goes to show you got afraid people were and how that cold war fear was subliminally passed down to their children. In my essay, I will be discussing women that were involved in combat during World War II, primarily as snipers in the Soviet Union. Women as young as seventeen signed up as snipers on the Eastern Front. The reason for this is because of the principle of communism: everyone was equal, therefore, gender in combat did not matter. In America, while the men were off fighting, industries hired women in traditionally masculine jobs. Women in America also served in military units in the Women’s Army Corps and in the US Navy as WAVES (Women Accepted for Voluntary Emergency Service); more than 86,000 women had volunteered (Hist, 421). The 40s are recognized as a time of war for most of the world, yet also of great opulence in the United States. In movies and TV shows, 1940s America has always been portrayed as glamorous and visually appealing despite the war overseas. Stories are set in the 1940s to amplify ambiance and the feeling of either great trepidation or great wealth. Great films have been made to adapt to the style, jargon, and life of people in the 40s. 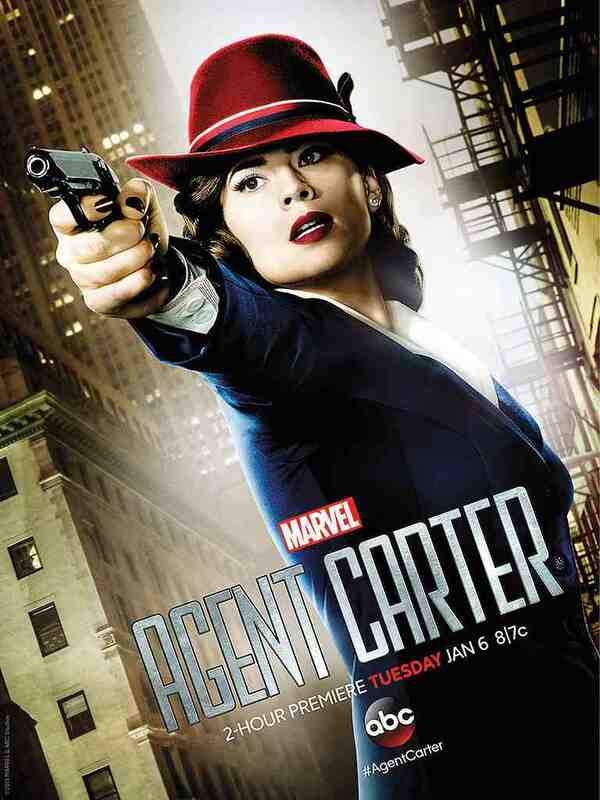 ‘Agent Carter’ takes place after the war in 1946 and does a good job in portraying American life after the war during a time of booming economic gains as well as the early rise of the Cold War and opposition against communism. The sixties were a time of great change that came with the want to deviate from the social norm. It was a time that could be described as “hedonistic,” but it was also a great counter-cultural era that promoted individualism and denounced conformity. The war in Vietnam only heightened the want for peace and neither the conservatives nor the liberals were ready to admit they were wrong. I personally believe that the want to be a unique individual still exists with us today, and as a fan of the counterculture, I would like to think that the influence of the sixties remains with us in some aspects. 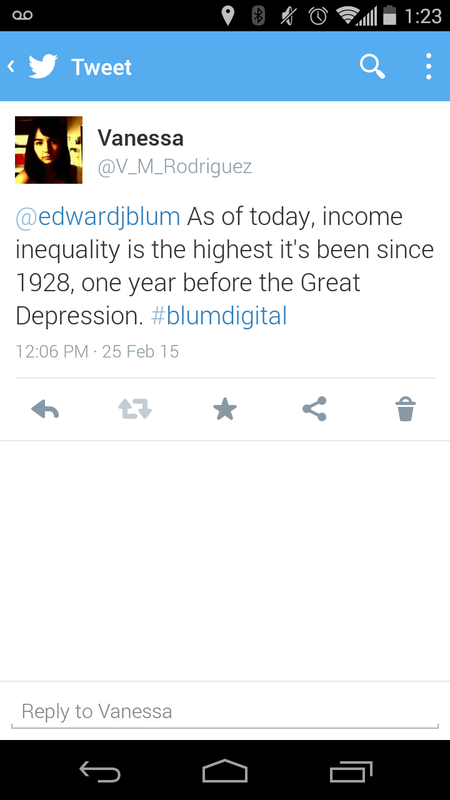 Before the lecture, Professor Blum asked us to tweet an interesting fact about income inequality. The resemblance between our economic situation beginning in 2008 and the economic depression during the Great Depression is uncanny. During the 2008 recession, large influxes of people became unemployed and were forced to move out of the state of California to find better jobs. Migrating families became popular, very much like the start of the Great Depression. In my group last week, we were supposed to discuss how the North and South differed in terms of urbanization. Before the industrial age, most of California was literally just hills and empty land. Nowadays we drive down roads and suburbs that were built decades before we were born, yet we don’t think about it. These roads were built by men who quite literally broke their backs over them, yet we never stop to appreciate it.